In 1993, there were two good movies released that were directed by actor/director Tony Bill. One of them was “Untamed Heart”, a romantic drama starring Marisa Tomei and Christian Slater – she had a broken heart and he had a diseased one and together they mended each other’s hearts. 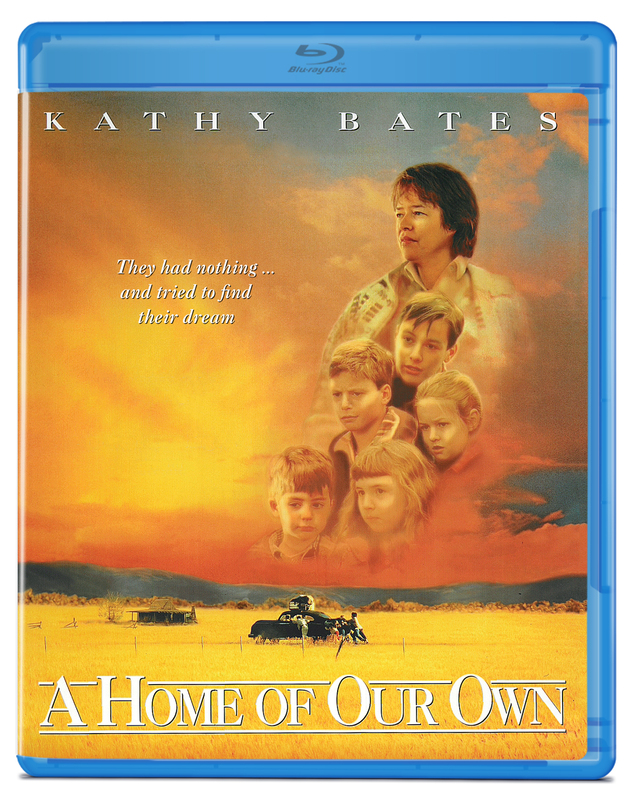 The other one is this movie, “A Home of Our Own”, which was headlined by Kathy Bates, who had a solid run of good (sometimes ‘great’) movies after winning an Oscar for her memorable role in Rob Reiner’s “Misery”. Despite their predictable and manipulative stories, I recall both of these movies being entertaining with performances that were solidly acted. When I think of them, especially “A Home Of Our Own”, I realize wouldn’t find an audience in today’s movie-going climate, much less get a green light from studios – if anything, they’d last a week in a theater and maybe find life On Demand or Netflix. 1993 definitely had a kinder, more accepting movie-going climate. 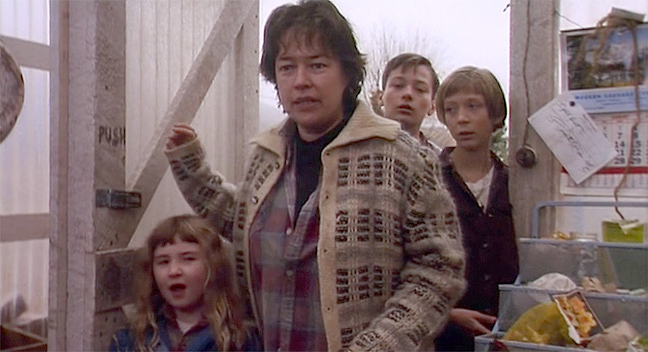 Bates plays Frances Lacey, a harried and stubborn widow in 1950s Los Angeles, who packs up her six children (three girls and two boys) run-down car and decides to find a new place to live. She has no idea where they’ll live, but after getting fired from her job for not reciprocating her foreman’s harassing advances and realizing the behavior of her eldest teenage son, Shayne (Edward Furlong), will lead him into trouble with authorities. They head northeast with the goal of a home of their own and an ideal image of such a spacious place Frances can call her own embedded in her mind. Since they have no money, it’s never touched upon how they would afford such a home, something that an adult Shayne wonders in voice-over narration, as he looks back on his past. With the help of Dr. Munimura (Soon Tek-Oh “The Man with the Golden Gun”, “The Final Countdown”, and countless TV shows from the 60s to the 90s), a Japanese-American who runs a nursery in the small town of Hankston, Idaho, the Lacey “tribe” (as Frances refers to her family throughout) wind up owning a shack of a house on his property through a good haggling of bartering and providence on Frances’ part. 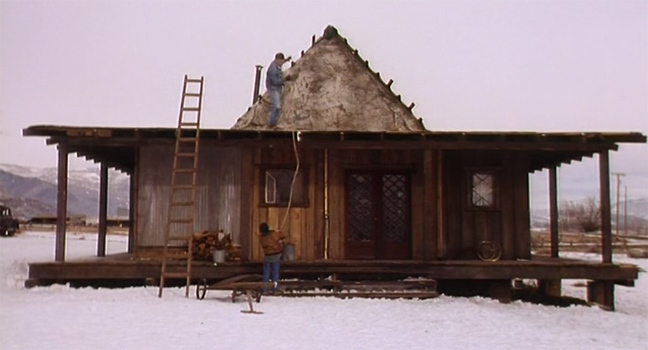 The house needs years of work and money put into it, but Frances has her entire tribe get involved and as we watch them pick up hammers and lift wood, we see a semblance of a house come together. It’s also the Laceys who are coming together as well as they learn to get by on very little with their stubborn and prideful mother leading the way. The family becomes close to Mr. Murimura, whom they call “Mr. Moon” and in turn he becomes an extension of their family. This makes sense when we come to learn why it is he lives alone on this expansive property surrounded by mountains. As much as there is progress surrounding the building of the family’s home, there is also inevitably going to be more external and internal problems preventing them from attaining the harmony and simple success Frances desires. The waitressing gig at the bowling alley Frances for in town only lasts so long as yet another man she works under harasses her (she admits she has a habit for “attracting assholes”) and Shayne becomes increasingly frustrating with he burden of watching after his five siblings all on his own. It’s going to take facing some internal struggles within the family in order for the Lacey’s to endure and thrive. “A Home Of Our Own” has a happy ending. That’s no surprise since every step of the movie could be plotted out by anyone who’s seen a coming-of-age period piece involving some boot-strapping stubbornness. There’s absolutely nothing wrong with that, since it is delivered in a genuine manner and not in cloying obviousness. It helps that Bates carries the film, supporting by the kind of emotional angst we would come to expect from Furlong (who played a handful of interesting roles from his debut in 1991’s “Terminator 2: Judgement Day” up to his role in “American History X” in 1998). Since she rose to the awareness of audiences with “Misery”, Bates has shown that she has this worn-down fighter persona down pat. She wears it on her face, her body language and her weary tone in Bill’s movie – from the first frame to the very end. The rest of the cast is rounded out by character actors with small parts and this who play the Lacey kids. Clarissa Lassig as Lynn places the eldest daughter with Sarah Schaub and Amy Sakasitz playing her younger sisters, Faye and Annie, respectively. There’s also Miles Feulner, who plays pre-teen Murray, a boy who builds a working relationship with the local scrap junk dealer (H.E.D. Redford) in order to help with the house. 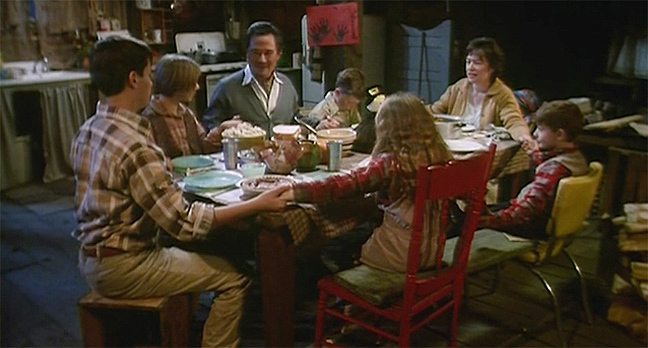 Besides Furlong, the only other recognizable child is young T.J. Lowther, who plays Craig, the youngest brother to the siblings. That’s because he starred in Clint Eastwood’s “A Perfect World” alongside Kevin Costner – a great movie which was released the same month as “A Home Of Our Own”. Pretty cool for a precocious 7-year-old. 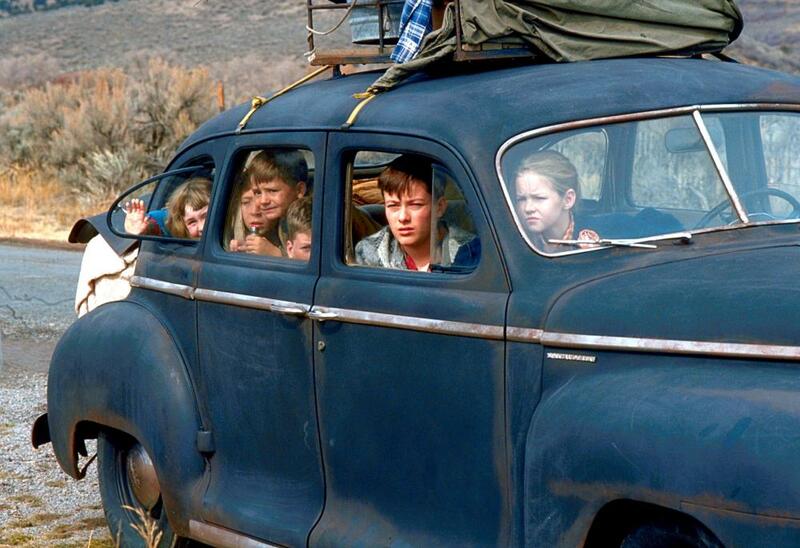 Many of these child actors were locals from Utah, where the movie was made and only a couple did any work after their debuts here. Director Tony Bill, who had been a working actor for some time in various television shows as well as “Shampoo”, “Pee-Wee’s Big Adventure” and “Less Than Zero”, appears here as a local doctor who sees Murray after he’s injured while working on the house. The screenplay was written by Patrick Sheane Duncan, who went on to pen such films as “Nick of Time”and “Mr. Holland’s Opus”, both released in 1995 and “Courage Under Fire”, which came out the following year. It’s unclear whether or not this story was based on his own past, even though the narration eludes to it. Olive Films releases this movie on blu-ray for the first time – just so they can, it seems. There’s no Special Features and the movie’s menu is just as static as other blu-ray releases from Olive Films, without even a language option. That’s no surprise, but it’s still disappointing and I’d find it hard to find any type of draw for any cold-purchase buyer – unless you’re a Kathy Bates completist. I mentioned above that two movies that Tony Bill made were released in 1993. I want to reiterate and add that neither them are great, but their predictability and manipulative sentimentality are in all the right places – places that are undeniably earnest and come from the heart. You won’t find that nowadays.